Native Singapore is an all-Asian success story. The current eighth best bar in the region combines “bizarre ingredients into bespoke cocktails.” But beyond attention-grabbing drinks that contain urban-foraged ants is a bar committed to sustainability and the use of local and regional produce. For Native, that includes ingredients like mango, turmeric, cinnamon, and tapioca, and regional spirits like Sri Lankan arrack and Thai rum. 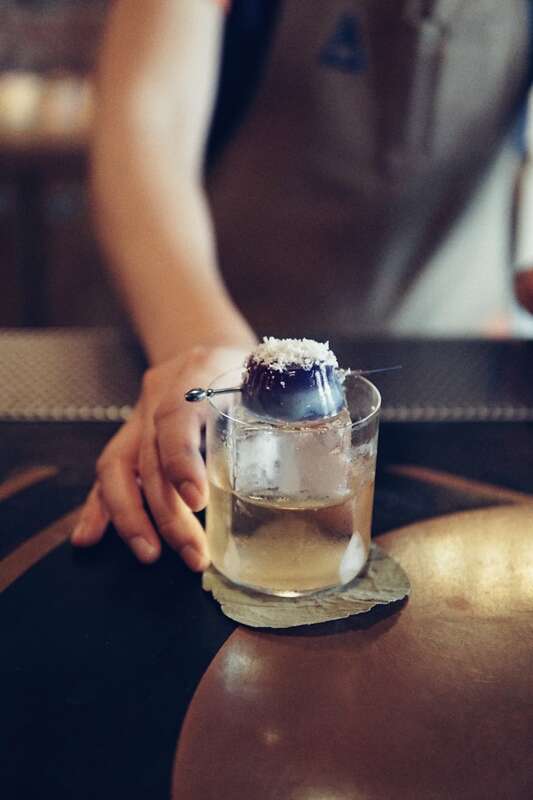 Founder, Vijay Mudaliar, formerly of another Singapore cocktail bar making best-of lists, Operation Dagger, instilled the Native Singapore team with an experimental mindset to connect cocktail culture with their roots and surroundings. 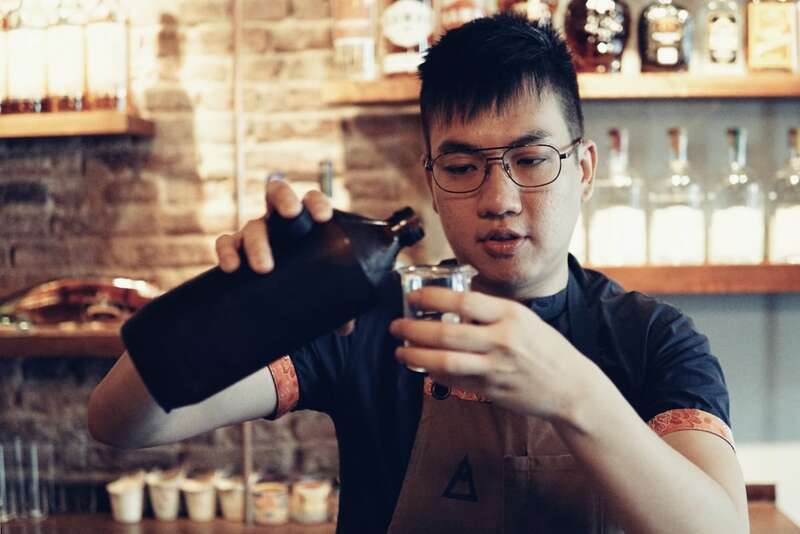 “At Native Singapore, the focus is on exploring who we are, where we’re from and what’s around us—we look inwards and make cocktails inspired by people, culture, tradition and location,” head bartender Leon Tan says as we take a seat at the bar during Vietcetera’s short May dispatch to the Lion City. Native Singapore is famous for its headline-grabbing cocktails containing ants. How do you maintain the right balance between concept, novelty, and taste? We build our cocktails from the ground up. That means we talk to small distillers about their process and take our inspiration from those discussions. We also speak to generations who came before us about how they used to eat and drink and try to bring those flavors back. To give you an example, our Peranakan cocktail is inspired by the local Peranakan culture—a rich hybrid of traditions which includes a very diverse mix of people, influences, and cuisines. We try to pay homage to Peranakan culture through the cocktail’s ingredients that includes jackfruit rum, laksa leaves, candlenut, pandan, and palm sugar. 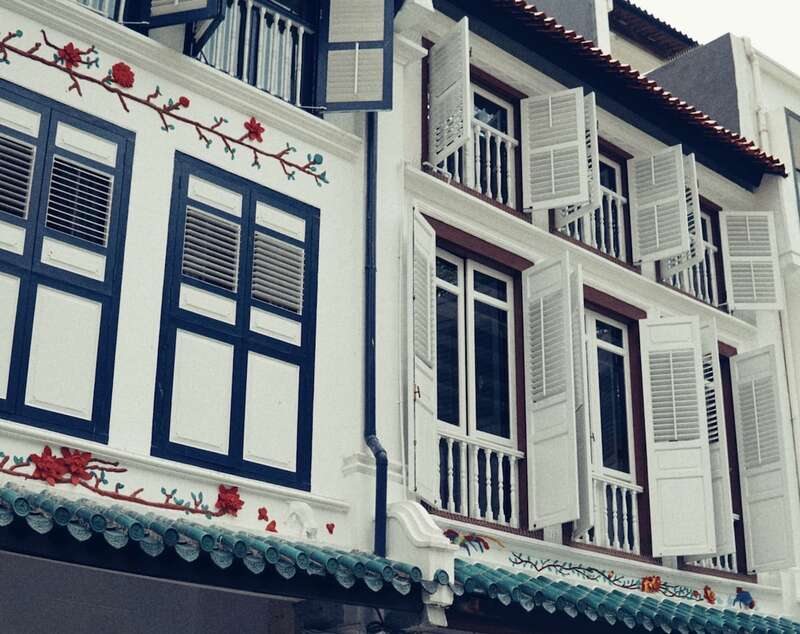 Amongst the shophouses of Singapore’s Chinatown is Native Singapore. Have you had any extreme reactions to items served from your Native Singapore cocktail menu? Singapore people have an experimental mindset around cocktails now. They are more willing than before to try new things. And we believe that eliciting a reaction is the basis for our whole concept—but not negative reactions, responses created by triggering memories and emotions. Certain drinks on the menu are supposed to feel familiar and evoke feelings, other drinks are meant to start thought processes. Hopefully, this will change your perception of what a cocktail can be. 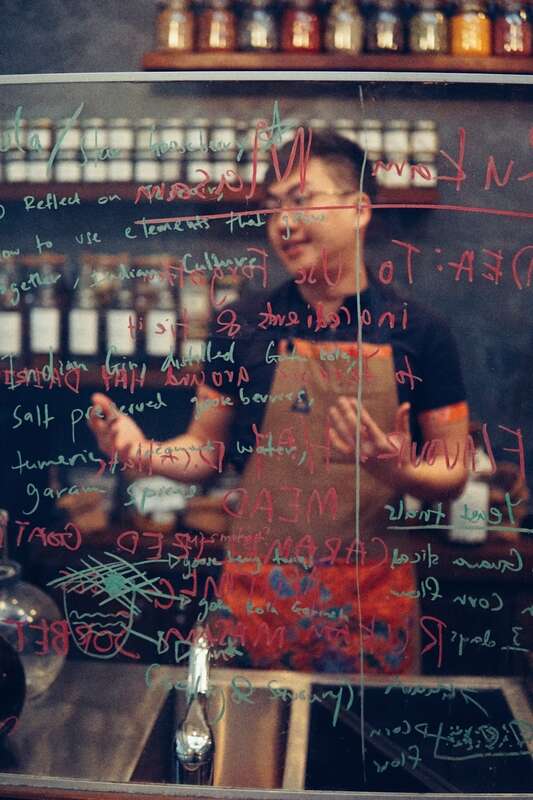 Leon Tan, Native Singapore’s head bartender, behind the bar’s mood board and lab, and in front of jars of fermenting and foraged ingredients. How often do you change your menu? 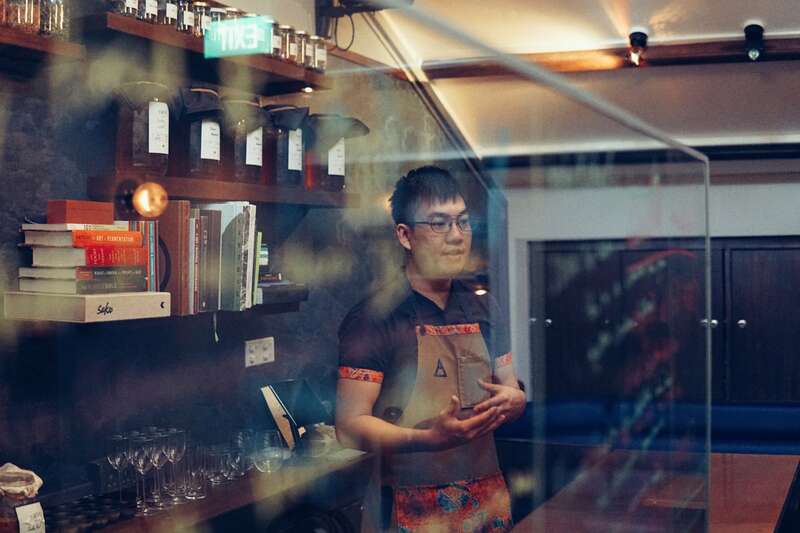 What is Native Singapore’s creative process like from initial idea to serving a new concoction? At Native Singapore, we’re constantly experimenting. As soon as we feel the time is right to showcase a new cocktail, we introduce it to the menu. Each item on the menu requires lots of preparation. The oolong kombucha, for example, takes four days to make. We really have to plan ahead, especially in time for the weekend. Our team comes in around two or three o’clock—we open at six—and they do their preparation upstairs where we extract flavors and run fermentation programs. There’s also an area with a mood board where we draft new ideas and also store foraged and fermenting ingredients. 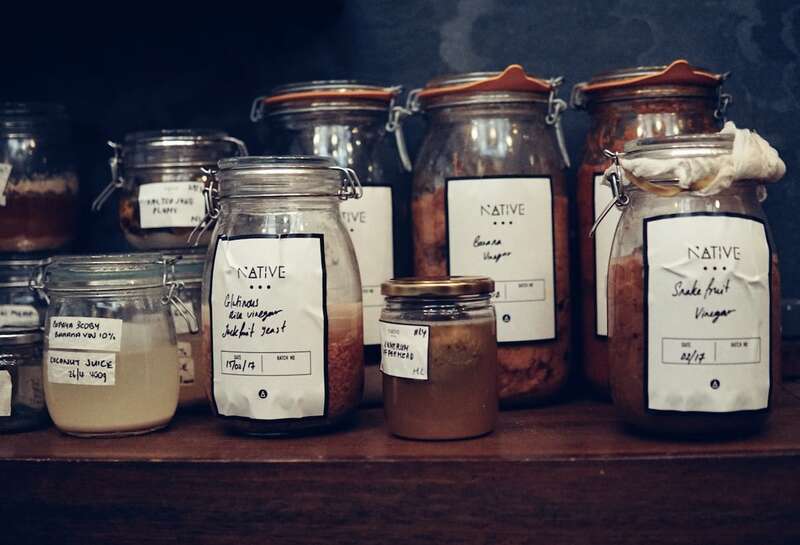 Snakefruit vinegar, jackfruit yeast, and other ingredients in Native’s ideas lab. Have you sourced ingredients from Vietnam yet? And what ingredients—based on your current knowledge of the country—would you be looking for? I’ve been to Ho Chi Minh City, but quite a while back—two or three years ago. We’re very aware of Vietnam’s rich gastronomic history. But we’re still scratching the surface of it. We have been working with some Vietnamese spirit manufacturers, and we’re in talks with some friends in Vietnam about the possibilities of exploring further. How important are awards and lists? Is it possible to effectively measure and rank bars in different countries and contexts? At Native, our core focus will always be about showcasing regional ingredients and being a platform for regional craftsmen. We stay strongly focused on our core beliefs and if that means we win awards then great. It’s a bonus. To be respected by our peers is an honor for us. We also see the awards element evolving by engaging more of the community. The #50BestTalks offshoot—a series of events where guests from top 50 restaurants and bars discuss what they do—is a good example. Their May event in Singapore was themed “Asia Takes On The World” and featured some of the region’s best bartenders. 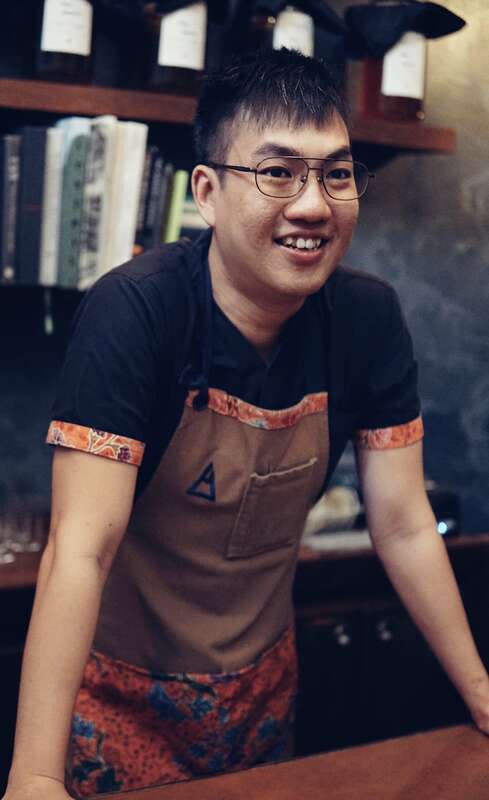 “We try to pay homage to Peranakan culture through ingredients that include jackfruit rum, laksa leaves, candlenut, pandan, and palm sugar,” Leon Tan says about Native’s Peranakan cocktail. Your approach of providing your customers with “wares, scents, music and more” seems very broad. How important is it for bars to go beyond just drinks? The entire idea was about the little guy—Native Singapore—working with more little guys…the theory of strength in numbers. There are some great craft distilleries in the region. We even play regional music in our bar, like Indonesian rap and Thai funk. And as a bar, we have the outreach opportunity to connect with people on a daily basis—customers, artisans, and craftsmen. This allows us to serve as a platform for people who might usually not have the chance to connect directly with their customers. 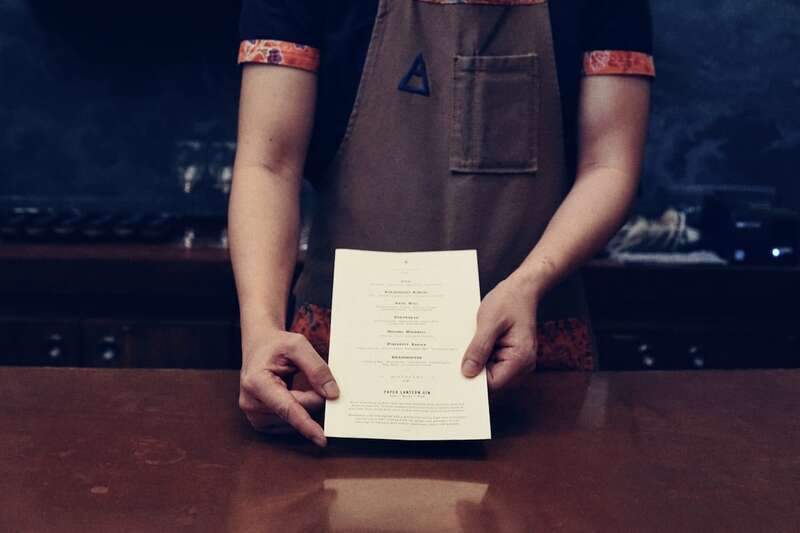 Native Singapore’s team are “constantly experimenting,” with menus that change as soon as a new idea is ready to be added. What advice would you give Vietnamese bars to help them get regional recognition and even global attention? From here, my perspective is that the scene in Vietnam is growing very quickly and I’m certain it’ll gain recognition very soon. It’s not really advice, but what we can share from our experience with Native Singapore is to focus more on your own identity and be less worried about global trends. Focus on genuinely connecting with guests based on your personal strengths. “Eliciting a reaction is the basis for our whole concept,” head bartender Leon Tan explains. Which are your top three favorite restaurants in Singapore—and why have you chosen those three in a city with so many impressive dining options? First, I’ll choose Cheek by Jowl, the Michelin-starred modern Australian restaurant, for its approach to comfort food that is still packed with amazing flavors. Then there’s Restaurant Ibid, which was opened up by the lawyer-turned-chef, Woo Wai Leong. It’s a Nanyang cuisine restaurant that pays homage to tradition and it’s always a pleasure to see that owner and venue operator establishing a new project. Finally, I’m choosing Candlenut which is a Peranakan restaurant—actually it’s the first Michelin-starred Peranakan restaurant. Its distinctly local flavors are a great testimony to Singaporean cuisine. And it has a great affinity with what we’re doing at Native Singapore. Sasha Wijidessa, the sous bartender at Operation Dagger who has been bartending for four years. She makes her own natural wines ranging from purple cabbage to starfruit which I feel are some of the most interesting and tasty concoctions in Singapore right now.